Central Colorado's Saguache Creek corridor has a rich history: once home to prehistoric peoples, it was also an important transportation route for the Ute Indians. The land has supported a ranching tradition since Spanish settlers migrated north from New Mexico in the early 1860s. Today, ranching continues to play a vital role in region's economy. But in recent years several large parcels in the corridor have been subdivided and sold, compromising the area's agricultural economy, its wildlife, and its spectacular beauty. 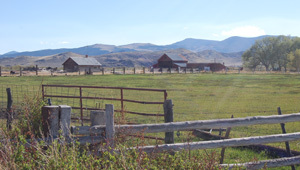 In September 2012, The Trust for Public Land helped place a 538-acre conservation easement on the Saguache Hay Ranch-the eighteenth easement in the corridor. The Trust for Public Land and partners have protected upwards of 13,500 acres since 1998-land stretching more than 20 miles west from the Town of Saguache. These easements are adjacent to other protected land in the corridor, permanently preserving wildlife habitat, scenic views, and the rural character of the community. In 2011, we received The Friends of Open Space Award for our ongoing work in the Saguache Creek Corridor. The Palmer Land Trust presented the award and also produced this video.